Extraordinary. Dr. George Horner, Terezin and Auschwitz survivor, performing music he played at at the Terezin concentration camp seven decades earlier. Only this time, he’s at Symphony Hall in Boston, joined by no less a figure than Yo-Yo Ma. The 90-year old Horner says quite simply: “Without music, I wouldn’t be here.” Thanks to the Terezin Music Foundation for posting this video. 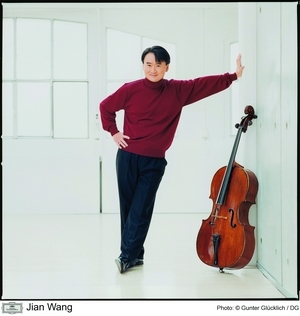 Unlike last year, I won’t be in front of the boobtube tonight for Oscar night; instead I’ll be doing one of my Concert Previews at a Washington Performing Arts Society – sponsored “house concert” featuring a terrific young Chinese cellist named Jian Wang, who’s in town to play various of the six solo cello suites by J.S. Bach. The Bach suites are both one of the absolute monuments for anybody who’s ever tried to pull a bow across a cello (or doublebass, or viola, or trombone, or, or, or…) but for my money they’re one of the Great. Alltime Works. By Anybody. Ever. In fact, I think there is something kind of miraculous about this music — music written almost 300 years ago that at times is the essence of simplicity, particularly the broken-chord arpeggios that lead off the First Suite – as simple, Rostropovich said, as breathing: “The phrase generates energy (inhales) untill it reaches a certain point when it is released (exhales).” If that sounds too technical, it doesn’t when you hear it. And out of this solo music Bach spins music more compelling than a symphony of a thousand, or a full-blown band with the volume turned up to 11.So all that got me to thinking about the juxtaposition of Bach and the movies, which after all are all about playing with our transitory emotions, fleeting embraces, and so on to create some usually mawkish, but very occasionally something profound and deeply moving. Which then got me to thinking about one of my all-time favorite movies, Truly Madly Deeply, made in 1990, and starring a very un-Severus Snapeish Alan Rickman and the terrific English actress Juliet Stevenson, and directed by Anthony (”English Patient”) Minghella. The Ghost-like plot (also from the same year!) revolved around the relationship among dead-cellist Rickman, his wife-in-another-life Stevenson, and her new beau….and the music of Bach is so powerful it’s almost another character in the film.Bach’s soundtrack abilities have not been lost on other directors, it seems. The Prince and Me – Julia Stiles, dir. Martha Coolidge, 2004. A Simple Twist of Fate – Steve Martin, Gabriel Byrne, 1999. Which brings us back to the beginning of this post, for Britten was also “inspired by Bach,” as it were….he wrote and dedicated the pieces to his close friend Mstislav Rostropovich after hearing the cellist play……..you guessed it, one of Bach’s solo suites. By the way, a tip o’ the hat to Naxos, both for their work in promoting and recording soundtracks by dedicated film composers, as well as for putting together a nice new database of classical music at the movies. There’s also a nice site called Classics of the Silver Screen. Finally, if I ever get asked to choose a piece of Bach’s cello music for the silver screen, I think I’d pick this. I’m thinking about it [signing to a record label]. I’ve always been thinking about it. But these great opportunities keep being handed to me. I think a lot of it is because I’m independent and it’s such a great story. There’s such a shift going on in the music world right now, and I’m sort of little guinea pig. Everyone’s helping out. At some point, if it gets to be too much, I’ll look for a partnership. I never liked the idea of being dragged around as a new artist. So I just want to get to a point where I have power and control and work with somebody, and not FOR somebody. Not bad for someone who, until May, was teaching in an after-school theater program in the Stapleton neighborhood of Staten Island, where she still lives with her parents, a dog and a pet rabbit in the house she has inhabited since she was born. “It’s so uncool, it’s cool,” said her mother, Elizabeth Egbert, the executive director of the Staten Island Museum. The Madonna Model or the Radiohead Revolution? So Madonna has given Warner Brothers the boot in favor of concert promoter Live Nation, while at the same time Radiohead has devised a pay-what-you’d-like scheme for their latest self-produced, self-distributed release, thumbing their noses at long-time label EMI. All in the space of a few days. The blogosphere – and the mainstream media, for that matter, are all a-twitter. Have we reached, then, the Tipping Point? Is it curtains for certain for the much-lambasted Record Industry? Frankly, I think the tipping has already happened. And I’m also not persuaded that the record industry’s days are over …. so long as they don’t think of themselves solely as purveyors of recorded, um “product” as Billboard magazine terms it. Magnatune was born out of the simple reality that is known to any classical musician: You don’t make your money from record sales. There are possibly a half-dozen living classical musicians you have a positive income stream from their recordings: Yo-Yo Ma, James Galway, Renee Fleming, Placido Domingo, Van Cliburn, and… Andrea Bocelli? Go ahead, name another. Same is true in jazz. 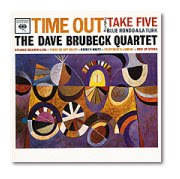 I’ll bet the only artists that actually get any meaningful income from records are Dave Brubeck (thanks to the perennial popularity of Time Out, released in 1959) and maybe Diana Krall. And even in larger the pop-music sea, that’s not and never has been where the money is — for 90% of the artists, that is. Even in the best of times working with a label was a deal-with-the-devil cost-of-doing-business proposition: You signed with a major because of the potential they represented to promote, market, and, if you got lucky, actually to move mass quantities of your physical “product” into the hands of your fans. Can’t do that selling your self-produced record out of the back of your trunk and running handbills off on a mimeo machine in the back room. Hands warned that more artists could follow Radiohead’s lead and take their careers into their own hands. “Why should [superstar acts] subsidize their label’s new talent roster – or for that matter their record company’s excessive expenditures and advances?” asked Hands. Madonna’s deal to abandon Warner Music for concert promoter Live Nation signals more than just a tectonic shift in the music distribution business: It shows how far Live Nation is willing to go to break the hammerlock Barry Diller‘s Ticketmaster has on online concert ticket sales. The core benefit to Live Nation of the $120 million recording and touring contract with the pop superstar is the opportunity to tap into concert, recording, merchandising and other lucrative revenue streams. But don’t discount the role that lowly ticket fees play. Ticket buyers may be annoyed by the $5 or more in fees tacked on to every ticket ordered online or over the phone, but they’ve proven to be a gold mine for Ticketmaster. Ticketmaster’s revenues jumped 14 percent to $1.1 billion in 2006 and generated almost a 25 percent operating profit margin. “…You can’t download a live concert – at least the real, in-the-flesh experience. Maybe you can hop onto BitTorrent and grab some amazing concert footage. Or even purchase a live performance album release. But what is your girlfriend (or boyfriend, bff, sibling, spouse, child, etc.) going to get more excited about – a video download, or a real ticket to a real show?One can be duplicated, viewed on-demand, and buried within a massive iTunes library. The other is a one-time, once-in-a-lifetime opportunity. Labels are now specialized in producing assets that can be reproduced instantly and infinitely. They are also specialized in an asset that is increasingly generating excitement for other assets they do not control. Live Nation makes its money off of something that can never be duplicated. And that is why they can afford the elephantine deal terms to lure Madonna. And even, if they don’t get all of the $120 million back out of Madonna (who will be 60 when the deal ends! ), what’s the value to Live Nation if they can break Ticketmaster’s hammerlock on sales??? I’d say……Priceless. So after reading all this, there IS a next logical step for the much-maligned record companies….what if Ticketmaster, for example, went out and bought EMI, a well-oiled production, distribution, and marketing machine?